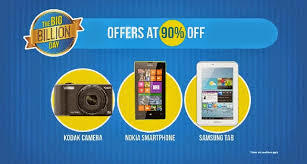 I am back with flipkart Big Billion Days Sale Day 4 Offers, this time you will enjoy crazy discount on Laptops, Tablets and Electronics. Day 3 Was a great success for Flipkart, Today You will enjoy Flat 10% Instant Discount On ALL Purchases. And many more offers, lots of offers you can't imagine are waiting for you.